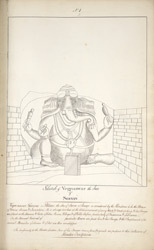 Pen and ink drawing an image of Ganesh from an album of 56 sheets of drawings (60 folios) mainly of miscellaneous architecture and sculpture in the Deccan and S. India, dated 1793-1806, from the Mackenzie Collection. Some drawings are by MacKenzie himself, others by his draftsmen, including C. Ignatio. Ganesha, venerated as Vinayaka in Tamil Nadu, is the elephant-headed, pot-bellied god of wisdom and remover of obstacles; he is therefore propitiated at the beginning of any important undertaking. He is also the lord of the ganas, the troops of inferior deities. He is a son of Parvati and only reluctantly adopted by Shiva. His mount is the rat and he is very fond of sweetmeats balls.